I feel like I just finished a marathon. With the weather so gloomy and muggy, I had no heart to cook nor photograph. Obviously, one does not have the luxury to wait until the sun decides to shine if you have to eat at home. I forced myself out of my chair this morning and put baingan bharta together. The delicious color and taste makes the effort worthwhile. Phew! Hope you enjoy baingan bharta, a scrumptious mix of egg plant in spices. I am so so drooling here, just looking to that pic. You can make this for me any time of the day. DROOL. Excellent pics! It looks yummy.I have been wanting to try this dish since long. Thanks for sharing this great recipe. Lipsmacking here, wat a fantastic baingan bharta..my fav..
Baingan bharta kandal ippol venamenu thonnum. Nice. Lovely Baingan bharta..just love your shots.. 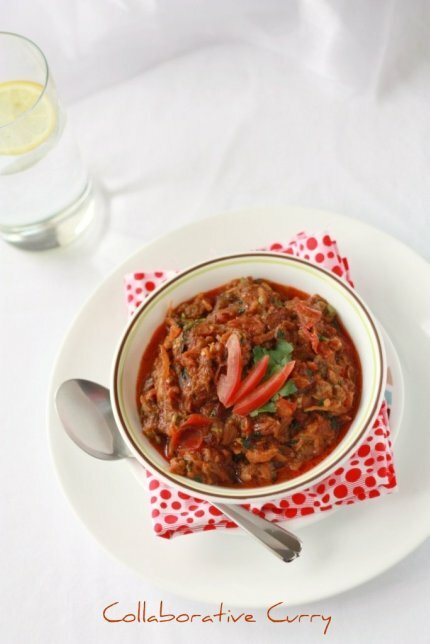 I love your way of spicy version of Baigan bharta! Yummy! Wow! 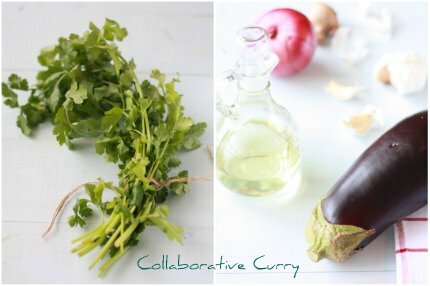 wonderful recipe and picture..too tempting..
not a big fan of brinjal, but this sure looks delicious.mayb i shud try it out some day..
My all time favorite :). bharta looks so delicious..great click..
Looks so corolgul ans spicy.. This sounds and looks delicious and it had to cheer you up since it is so colorful! Hah, I bought some eggplants too last weekend....still sitting in my fridge! LOL! Love the recipe. I recently made baingan bhartha. My all time fav. Pics are very nice. Eggplant is RIGHT up my alley!! Looks wonderful; thanks for sharing. One question though: what is brinjal? Looks mouthwatering... Lovely shots... cannot take my eyes off. Oh we do make a similiar aubergine dish but a salad kinda with wood fire grilled aubergine...its great. Bharta looks so spicy n Yummm! Nicely presented and looks professional. Awesome ya. Bartha looks so delicious and beautifully captured on camera too. I love eggplants....this looks delicious! We would like to pass on the Sunshine award to you guys :) Please stop by our space to accept it. nannayirikunnu :) ethu tomatode color aano. ?nalla red color vannitundu. looks yummy...and have to say adipoli click...might be sounding monotonous when i say lovely click with each of ur posts...but can't help it...love ur clicks!!! This is a lovely eggplant dish, look so yummy. what a delicious recipe with drooling picture. 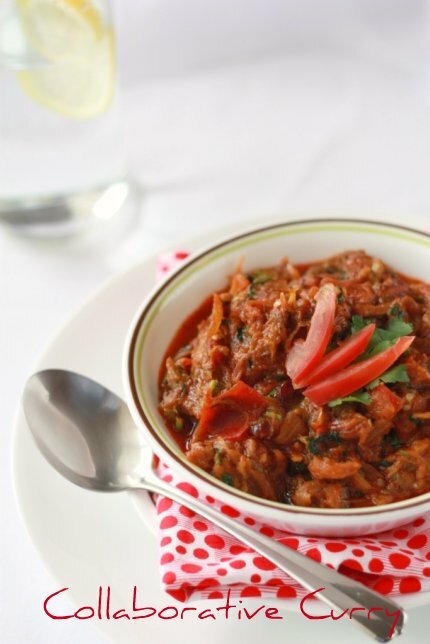 Delicious and mouthwatering baigan bharta! The color is awesome and wish i could taste right away! My favourite! How do you get yours looking so red? I am drooling over these beautiful pics ! We call this Punjabi style Baigan bharta - quite a favorite with all. wonderful pics....dish looks hot and colourful...nice presenentation! Dear,, Please collect your gift from my blog. i was thinking of posting this lol!! looks great and one of my all time favourites!! Im getting hungry just thinking abut it! Very nice recipe - and nice presentation too. my absolute fave veggie cooked just i like it!!! What a beautiful dish to just put together last minute. I have not had the one before! Love this colorful baingan bharta !! color and click looks tempting ! !